Mellissa Jagrup-Lee and Benjamin Conrow, founders of Alive and Well Corp, first met while working together for the Hillsborough County Department of Children's Services. Jagrup-Lee and Conrow worked with foster care and youth in the community through the program, Children in Need of Services, Families in Need of Services (CINS FINS) with a goal to provide therapeutic support, while assisting, and strengthening the youth and families in Hillsborough County. As Jagrup-Lee shared, with the children being in foster care, many had experienced stressful and, in some cases, traumatic situations that required advocates that would care for them and make sure they had the appropriate support. At some point, Jagrup-Lee and Conrow started discussing the idea of having their own wellness center to allow them to get away from the politics and red tape that tends to overshadow government programs. "We discussed what it would be like and the idea got us really excited," Jagrup-Lee said. "Ben is a Certified Behavior Analyst and a Certified Yoga Instructor. I'm a Licensed Mental Health Therapist. We talked about combining our skills and opening a center that focused on the mind, body and spirit. The concept would revolve around counseling, yoga and massages to help with stress, trauma, conflict, depression, anxiety and everything else that eventually trickles down to your body. We wanted all of those services under one roof. Our next thoughts shifted to, 'Where would this wellness center be?'." In 2015, Jagrup-Lee left the Department of Children's Services to work for a company that worked with insurance companies to assess clinical information and approve hospital stays for patients dealing with mental health issues. After six months of working there, Jagrup-Lee was allowed to work from home. She had some connections in Lake County, a Central Florida County known for healthy lifestyles, natural beauty and an economic climate supportive of entrepreneurship and small business growth. She ended up moving to Clermont and, as the search for the wellness center resumed, things sort of fell into place. "We finally found the perfect location for Alive and Well Corp," she said. "It was a space that met all of our needs. We opened our doors in March of 2018 and had our grand-opening in June. The mayor came out for the ribbon cutting and the community has been extremely supportive." Jagrup-Lee shared some of the challenges she and Conrow faced when they opened their doors and continue to face today as they look to expand their impact on the Central Florida community. "At first it was, 'How are we going to let the community know we're here? '," she said. "Advertising is not cheap. For us, it came down to building connections and relationships throughout the community. We joined the Chamber of Commerce and got plugged in. That was huge for us. An ongoing challenge is trying to find the balance between bringing in revenue and helping as many families as possible. A lot of families we work with are in lower-income brackets. If they have to decide between paying rent and/or paying for their next meal, therapy will take a back seat. For those situations, we use a sliding scale to discount our costs. We don't want anyone to not get the care they need because they can't afford it." 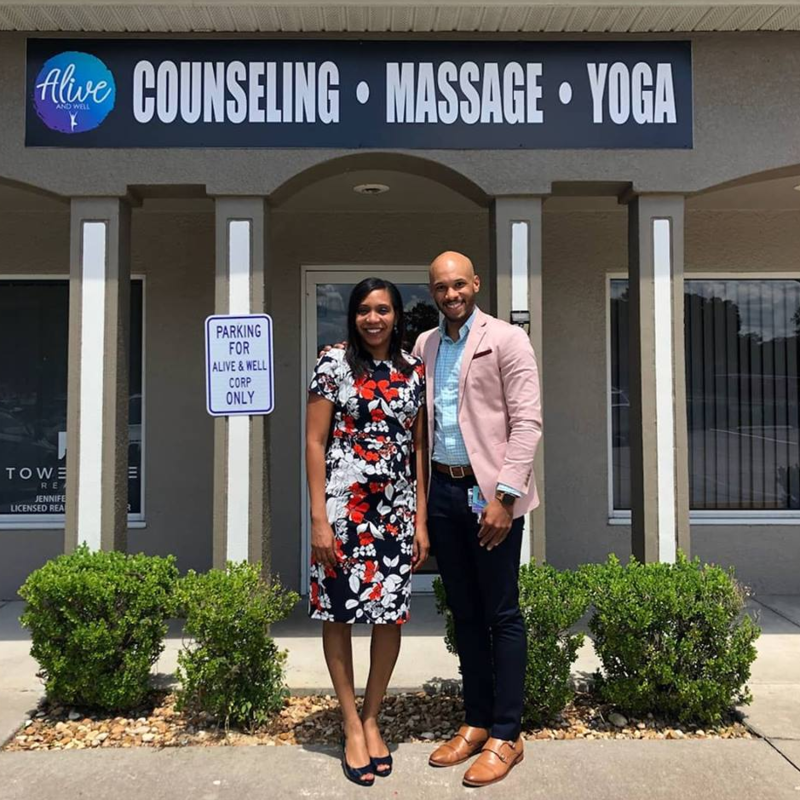 Not long after opening their doors, someone suggested that Jagrup-Lee and Conrow should connect with the Lake County school system to offer their services to students in need. They took that advice and, after a long application process and several in-person visits with school officials, they were approved. They now go to schools on a weekly basis where they meet with students and families in need of therapy. For Jagrup-Lee and Conrow, two business partners that truly embody the meaning of altruism, getting feedback from families they've assisted is what they enjoy most. "I had a dad at an elementary school share with me how much of a difference he's seen in his daughter's behavior since she started therapy," Jagrup-Lee said. "We get a lot of teenagers with high anxiety. It's an amazing feeling when we free them of that anxiety. We've created a safe place where people can come talk to us, but our ultimate goal is to help them create their own toolbox that they can go to if we're not around. We teach coping skills and techniques they can use on their own. We don't want anyone to leave empty-handed. We had one guy in his early 20s whose mom said she was going to call the cops on him if he didn't go to therapy. When he came in, he was cursing and yelling and obviously didn't want to be here. After an hour session he told me, 'This is the most peaceful place I've ever been. Can I come back?'. A few days later his parents came in and expressed their appreciation for what we did. That's the kind of feedback that drives us forward." Looking ahead, Jagrup-Lee and Conrow would like to add more therapists to handle more requests from different clients. They're also focused on getting out into the community and expanding their reach. They want people to know that there is support and that self-injury or even suicide doesn't have to be your last resort. What advice does Jagrup-Lee have for aspiring entrepreneurs? "Lead with your heart," she said. "I felt a calling for this. I didn't plan to open my own business, I just knew I wanted to help people. I saw a need and I stepped out on faith. Also, don't ever give up despite the ups and downs and be open to learning. If you make a mistake, be willing to say that didn't go so well and move on. Look at how to improve things going forward to ensure the mistake doesn't continue to happen. Be open to the journey of learning and growing. Also, be humble enough to ask other people for help. Support from friends, family and colleagues is huge. When you venture out and grow, you learn who's there to support you. That circle of close friends becomes smaller and more defined. When you start making big decisions, you'll see who the important people are, who has your back and who cares about you. Whether you fail or not, those people are there for you and will support you. Let go of the naysayers and hold tight the people in your inner-circle."